Is is still possible to get into the park? Only if you feel like hopping 6 foot chain link fences. Do you need a permit to shoot there? Theoretically yes…but see the answer in the next question below. Can I get a permit to shoot there? NO. Since visiting the park I have spoken to the main person at the city in charge of booking the space for movie and TV studios. She informed me that they DO NOT want any photographers or videographers, or explorers visiting the park and that they will not grant any permits to these individuals. They do not want people documenting the current status of the amusement park. What do Movie and TV studios use it for? They are mostly utilizing the parking lot area which is pretty big. From what I was told they do not use the abandoned structures for their productions either. But there’s no way I can verify that. Do homeless people live in the park? (Urban Legend Debunked) No. If you understand where the park is it is competely unfeasible for a homeless person to live there and have any chance at panhandling etc. Unless he/she is survivorman there are no food sources in the park. There are simply a lot more feasible areas for a homeless person to find the help they need. The park is located about 20 minutes from downtown New Orleans so it would also be hard for them to get there. Are there gangs in the park? (Urban Legend Debunked) No. This one is particularly funny to me because if you understand anything about the way the park is, I think this could be one of the last places a gang would want to go. Why? Well because if the cops come to do a random check on the place the gang members would be stuck in there with no car, and no quick way to exit the park. In essence they would be trapped because there are very few ways to get in and out. Am I a cop? Do I know for sure? No. But in my experience there have been no signs of anyone living or residing at the park, much less gangs making it their headquarters. Do the cops regularly patrol the park? Yes they do. I know from firsthand experience that they indeed come into the park in cars…so they can move much faster than anyone on foot. I’ve also been told by others that have made the trek since my time there that they have also been caught by the cops. So anyone going in should assume they will be caught. Do the cops have keys to the park? Yes they do. Meaning they can come and go quickly and you can’t. Another reason it isn’t a good idea to go. Things have changed quite a bit since I went there. Do you think the movie studio that’s leasing the park will let me in? LOL, I highly doubt it. How do I know? I’ve asked. Movie studios could care less about Urban Explorers or Photographers. They are concerned with maintaining the secrecy of their project. They will also tell you that their insurance doesn’t cover you if you get hurt. I’ve told them I have business liability insurance and will give them a release of liability…they don’t care. And when they’re there they have security 24 hours a day, 7 days a week as required by the city when a company is leasing the property. Is it dangerous to go Urban Exploring? It can definitely be very dangerous to go Urban Exploring, especially by yourself. The biggest concern is that you get hurt and you have no way to contact someone if you do indeed need help. I personally inform my assistant and wife anytime I am Urban Exploring by myself and they are aware of where I am should I go “missing” or become incapacitated. That being said I am very experienced in Urban Exploration. I am aware of what dangers to look for and to also be very methodical in my approach to exploring and shooting. People who go running around screaming and yelling, jumping off things etc. are bound to harm or kill themselves. There are simply too many things that can go wrong. One more note…I absolutely do not recommend that any minors engage in Urban Exploring. Wait until you are an adult and can take responsibility for your actions. So is it impossible to get into Six Flags New Orleans now? Nothing’s impossible, but it’s just not worth the risk. One of my key rules for Urban Exploring is that the facility has to be open and there must be an easy way to enter and exit. This isn’t so I can run from the cops…it’s actually so I can exit quickly if there were some unsavory characters in that building. Quite frankly the cops would be the most welcome sight at a place like this compared to someone who might want to do me harm or steal my gear. Even though i said there aren’t gangs residing there, that doesn’t mean that someone bad couldn’t go in there looking to rob someone. With the fences and gates now up the only way to enter the park would be through the swamps and lakes that surround it or by scaling the fences. Carrying the gear that I do that would be pretty difficult for either scenario. Also, with the abundance of alligators in the water I strongly discourage that approach if you would like to keep all of your limbs. So at this point it isn’t worth going back for me either. What destroyed the park? Why is it still abandoned? It was destroyed by Hurricane Katrina. I guess the rumors are that Six Flags wasn’t doing too well with the park as it was before the storm, so when it hit they weren’t too reluctant to let it go (but that’s just what I’ve read). They took some rides out of the park and shipped them off to their other amusement parks, and then from what I understand they walked away from their 30-year lease. So the city took control of the park and they haven’t done anything with it for a decade. When I spoke with the cops who found me in the park they told me that the city was so broke they couldn’t even afford to lock up the gates. Well, it’s been locked now so obviously that wasn’t true. 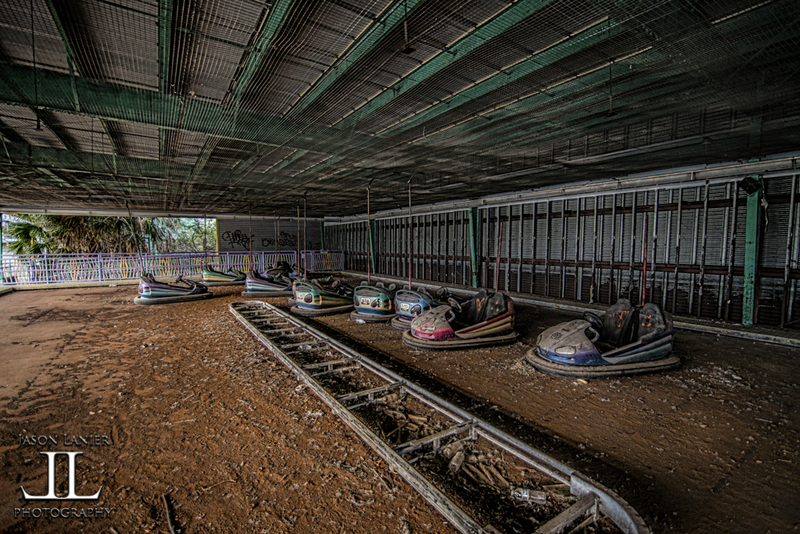 There have been countless plans to convert it into shopping malls, housing, and to restore it back to Jazzland. As of me writing this none of them have come to fruition. There are some good people trying to get in there to restore the park, but the city is in no hurry to move. It’s been a decade so they don’t feel any rush to do anything with it. Some people think it’s right in New Orleans…well, it’s not. What’s the area like around the park? Where is it located? The park is located about 20-25 minutes east of downtown New Orleans. It’s very easy to City Hall and the residents to forget about the park. The surrounding houses adjacent to the park are in a lower income area and the cops have told me the neighborhood is very dangerous. I personally never felt very scared while I was there, but if you did come across the wrong person, it would be a good place to have someone “disappear”. I did see a completely torched car on the side of the road one time when I was there. That looked pretty dicey…lol. Any efforts to get into the park require you to park your car in one of these neighborhoods and walk a mile or two to get in. That’s actually one of the hardest parts of the trek and potentially most dangerous. Again, nobody has ever bothered me…but it could happen to someone. So is there any hope for me to be able to get into the park? Well, I’ve reached out to groups that have bids on the property hoping restore it back to Jazzland. They’ve told me if they get the park they’d love to have me come in there and shoot it before and after restoration which I would LOVE to do. So that’s about the only chance possible that I see for any photographer to get in there again. Have any questions that I didn’t answer? Leave a comment in the box below and I will get to it as soon as I can….